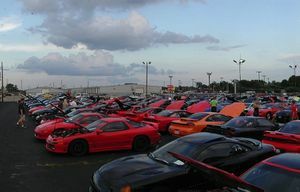 The 3S National Gathering (3SNG) is the largest annual event for the Mitsubishi 3000GT and Dodge Stealth platform in the world. The origin of the 3000GT/Stealth National Gathering can be traced back to the DSM Shootout in August of 2001. Two members of the 3S community, JeremyG and TiffanyG, had just purchased a 1991 Pearl White Dodge Stealth the month prior to the shootout and were attending their first car event ever. Not long after, Jeremy and Tiffany met many other 3000GT/Stealth owners, including: XWing, Hans91GT, Trevor, RacerX, Dave Best, 3SX (now 3SX Performance), Matt Monett, Eric Bowden (SUTHNR) and several others. A conversation started between them about gatherings. Eric Bowden told Jeremy about the East Coast Gathering and Jeremy mentioned how cool it would be to have a national event just for 3000GT and Stealth owners and their cars. They discussed the idea of having many racing events, a car show, and more. The ultimate goal each year would be to find a “Best All Around” 3000GT and/or Stealth. Eric wished Jeremy luck. Not long after, a thread started on 3000GT/Stealth International discussing national car events and how awesome it would be to hold a nation-wide event just for the platform. Many people voiced their opinions and thoughts on the matter, but no one had volunteered to take on the task of making it a reality. After giving it more consideration and several weeks of persuasion and discussions, Jeremy talked Tiffany into giving it a try. The only stipulation that they made was that the event needed to be held in their hometown in order to make the undertaking less work and to minimize the risk. Together they made a post asking if anyone minded if they took lead on the project. After no objections the 3/S National Gathering was on its way of becoming real. Making a gathering of this size was completely new territory to both Jeremy and Tiffany. They had no idea what to expect or how many might attend, as they were new to the community, only had the opportunity to meet a few other 3S owners at the DSM Shootout, and had never attended any other 3000GT/Stealth Gatherings. At the time, they were hoping to be able to get at least 50 cars show up. After they had announced their plans with the dates for the first National Gathering set, the topic became a huge conversation piece throughout the community (much to their surprise). Several people stepped up to help, including those who Jeremy and Tiffany had never met. One volunteer was Matt Saskin (3SI member msaskin), a then 17-year-old from California who was willing to design the website and registration form for the event. He made the drive from California and arrived several days early to help with the final steps. Without Matt’s help, the first National Gathering would have been very difficult for Jeremy and Tiffany to pull off. August 9, 2002 had arrived, the small town of Elkhart was in awe as nearly 180 Dodge Stealth and Mitsubishi 3000GT’s invaded the small town. This was such an amazing sight! Never before had this many 3000GT and Stealths been together in the United States. Although the event didn’t go 100% smooth (registration was a disaster, all the events started late, and they were way too many events scheduled in such a short amount of time) it was still the talk of the town and the 3S community for the next several months. On the final day at the banquet it was announced that the 2003 National Gathering would be held in Saint Louis, MO. The local chapter was to plan and run the event with guidance from Jeremy and Tiffany anytime they needed it. The event was well planned and they had made many improvements to the event. It was considered a success and fun was had by all. The event was changed to 5 days so all events could be more enjoyable. The NG was also taken to the next level by having the events held at Gateway National Park. Having the events at a nationally known track set a new standard for all future locations. The event ended up hosting 183 cars. Although the event was a success, after a meeting with the sponsors, a decision was made that the only way this event could be a total success in the future was if a committee was founded and the same people ran the event year after year. After being asked by the sponsors, Jeremy and Tiffany decided to continue planning the event with the help of a committee. They asked John Monnin and Alan Sheffield to help them form the first National Gathering Committee. This meeting shaped the future expectations of the National Gathering. The 4 of them spent the first couple of months discussing what changes needed to be made to make this event a “national” event that could be admired by all car groups. They came up with the decision that 2004 would be held in Indianapolis, the racing capital of the world, July 14-18. Many plans were made to make this new location much bigger and better than ever. All the racing events we held at Indianapolis Raceway Park. A special behind the scenes tour of Indianapolis Motor Speedway was also added to the year’s activities. This included special tours of the entire track, press box, etc. We also made arrangements for the “Official Car” of the 1991 Indy 500 (the Yellow Dodge Stealth) to be brought out on display so everyone was able to see the car that had been in storage for many years. The event was a huge success and to this day is considered to be the best 3/S National Gathering ever. The event also broke a new record with 198 cars. Due to the success of the event and with only major problem being Mother Nature bringing rain during the drag races, the committee was comfortable with moving the event further away from home. They made the decision shortly after the end of NG04 to move the event to Memphis, TN. The dates were chosen and locations and official hotel were set but due to circumstances out of their control, this location could not happen. This information came extremely late in the planning process. A new location had to be found as soon as possible. After contacting a few other locations the committee decided to move closer to home in Michigan, but utilize a nicer drag strip. That is how Saint Joseph came about. The 2005 event was designed to be more of a social setting, and “getting back to basics” while still keeping the racing events high-quality locations. It was also decided to move the car show to the beach and turn the banquet into a picnic at a park instead of at a banquet hall. As the planning was happening Jeremy and Tiffany decided this would be their last event. The event was planned and ended up being a record setting year both on and off the tracks. The car show at the beach was a huge success and enjoyed by all! Also, a milestone of NG05 was Jeremy’s dream of crowning a “Best Overall 3/S” was also added as a competition. This ended up being the largest event to date with 234 cars! Following the 2005 National Gathering, and for the first time ever, no future plans were made for the National Gathering. A thread was made on 3si asking if anyone was interested in taking over the event. Hundreds of posts and several months later, no one stepped up. Instead of just letting the event die, Jeremy and Tiffany decided they would lead for one more year but that it would have to be their last. John also had announced this would also be his final year on the committee as well. Alan decided to stay on and help form a new committee to ensure the event would continue. During the planning of this event, a new committee was also being founded. Resuming their positions on the committee, Jeremy announced that the 5th annual 3S National Gathering would be taking place once again in St. Joseph, MI . The 2006 National Gathering had a respectable 183 cars in attendance. All events ran with no rain for the first time since the first National Gathering. It was re-announced during the banquet that future 3S National Gatherings would be headed up by a new committee and that this would be the last year that Jeremy and Tiffany Gleason would be on the committee. The new 3S National Gathering committee, which consisted of five members (Josh from Ohio, Alan and Lori from Michigan, Christy from Georgia and Peggy from Colorado, announced that they wanted to keep the National gathering in St. Joseph for one more year. The idea was that this would allow the new committee to get a foothold on how to run the event, and because the tracks in St. Joseph were known to be extremely easy to work with and only required minimal pre-planning . The 2007 National Gathering has since happened and is in the history book. No official attendance numbers have been released but as far as we can tell, the event was enjoyed by all. The committee for the 2008 3SNG consisted of Lori Sheffield, Alan Sheffield (Alan92RTTT), Peggy Schafale (Peggy), Josh Anker and Christy Pensinger (Stlth664/cty) . New to the program this year was an inclusion of an extra day to allow for a 'Driving School' event hosted by Race On. The 7th annual 3S National Gathering had a basic registration cost of $100. Some of the events available were drag races ($45), AutoCross ($35), an invite-only road course event ($120), the newly added driving school ($360), and a banquet event with mansion tour ($35). 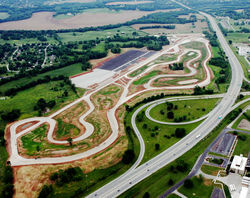 Venues this year included the Memphis Motorsports Park, which is regarded as one of the most popular and versatile racing facilities in the country (hosting upwards of 200 events per year, including the best that NASCAR and the NHRA have to offer). The drag races were held at the NHRA Drag Strip Facility; home of the NHRA Powerade Drag Racing Series, the NHRA Lucas Oil Drag Racing Series, the NOPI Nationals, the Super Chevy Show, the BTE Million Dollar Drag race and the Pro Street Car World Finals. This facility is considered one of the fastest tracks on the NHRA circuit. Lastly, the banquet was hosted at Graceland, which included an after-hours tour for NG participants only. Platinum tickets were available for those that wanted to see Elvis After Dark, both jets and the auto museum. Keith (Mobo) Upton, a community member and owner of Performance Imagery, provided professional photography for the event this year as well. In August of 2008, the 3SNG moved their website from www.3SNationalGathering.com to www.3sng.org. Similar to the year before it, the 2009 3S National Gathering was once again hosted in Memphis, Tennessee . The race events were also held at Memphis Motorsports Park. A participant package was available for $100, which included access to the drag races, autocross and road course. A weekender package was also available for $60. Just after the 2009 3S National Gathering, Alan Sheffield initiated a website redesign contest for 3sng.org. The prize was to be announced, and would be voted on by other members of the community. Around April 2010, the 3SNG website was redesigned to the blue, yellow and white theme. 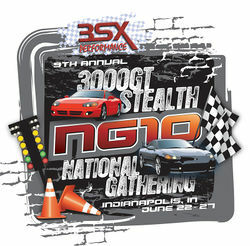 In the first time since 2004, the 3000GT/Stealth National Gathering returned to Indianapolis, IN. Different from 2004, however, was that the track events were held at the O'Reily Raceway Park. The schedule for the gathering included a day for registration (June 22nd), a road course (June 23rd), an autocross (June 24th), drag races (June 25th) and to conclude the week: a day for a car show, banquet and award ceremony (June 26th) . The car show was held at the most popular tourist location in Indianapolis, the world-famous Monument Circle. A full registration for the event ($120) included a t-shirt, access to all events, the banquet and car show entry. A special weekender registration was available as well for $80, which also included a t-shirt, a drag race spectator pass and access to the banquet and an entry to the car show. Returning for a second year in a row, the 2011 3S National Gathering would once again be at the O'Reily Raceway Park in Indianapolis, IN . For three years running, the 2012 3S National Gathering was held in Indianapolis, IN. Different this year was that the track events were held at the Lucas Oil Raceway Park . In the past 5 years, the 3S National Gathering has hosted over 1000 3/S car’s. Close to 45 of the states have been represented and many world records have been broken. The event has helped shape current 3/S gatherings and has also helped make many new friends throughout the years. 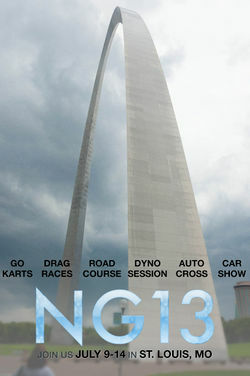 After much speculation and anticipation about where the next 3S National Gathering would be held, the NG Committee Chairperson, Lori Sheffield, announced that the 2013 3000GT/Stealth National Gathering would be held during the week of July 9th - 14th 2013 at the Gateway Motorsports Park in St. Louis, Missouri (specifically in Collinsville, IL) . This gathering will mark the first return of the event to the St. Louis area in nearly a decade. Registration officially opened on April 9th, 2013. With it came a revamped website created by Alan Sheffield and an updated gallery of photos from previous 3S National Gatherings. Prices were also announced with discounts offered for those that register prior to June 9th (one month before the date of the event). Registration before June 9th starts at $100/person, while those that wait until after June 9th will pay around $125/person. For the first time in years, the 2013 3S National Gathering did not offer a "Weekender Package." Committee member Alan explains that the weekender package was discontinued because no one was using it (less than 10 people in 2012). Further 3SNG Committee Chair Lori corroborates this, explaining that keeping the weekender package was problematic due to the insurance costs remaining the same and because it required the National Gathering to take a hit on each registration that used it. Brand new to the 3S National Gathering in 2013 will be the inclusion of a Dyno Day (xwire's Morgan Motorsports) and Go Karts (Pole Position Raceway). The official date and location has been announced for the 2014 3000GT/Stealth National Gathering. NG14 will be hosted during the last week of June 2014 at the Pittsburgh International Race Complex (formerly known as BeaveRun) near Big Beaver, Pennsylvania and at Pittsburgh Raceway Park in New Alexandria, Pennsylvania. 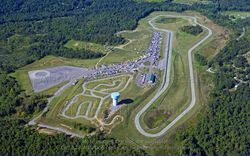 Built in 2002 and praised as one of the most beloved road courses on the east coast, the six acre Pittsburgh International Race Complex (Pitt Race) has a little bit of something for everyone. Some of the attractions at the world-class race complex include a 16ft wide, 1.53 mile, 12-turn road course, as well as a 26ft wide, 0.82 mile, 17-turn FIA Pro Karting track. The complex also has a large vehicle dynamics testing area, which is perfect for hosting autocross events. Following the 2013 3S National Gathering held in St. Louis, which was the furthest west the National Gathering has ever been, Pittsburgh will officially be the furthest east that the 3S National Gathering has ever been. Early registration for the 2014 3S National Gathering officially opened on March 21st, 2014. Admission and event prices were originally set to increase after May 15th, 2014, but was courteously extended to May 30th, 2014. The NG14 utilizes a completely revamped registration system software created by Alan Sheffield (Alan92RTTT), which allows members to select and pay for the events they wish to participate in. To read more and provide feedback, please visit the development thread here. Just weeks after the completion of NG14, the 3SNG committee made a surprise announcement that the 2015 3000GT/Stealth National Gathering would be held at the brand new National Corvette Museum in Bowling Green, Kentucky. The grand opening of the track was scheduled for August 2014, which made the track less than a year old by the time the gathering took place. Additionally, the NG15 car show joined Cars & Coffee at Griff's Deli on Saturday morning. Unlike the 2014 3S National Gathering, there was not an official plan for Go Karting this time around. "Touring Sessions" were offered on the road course this year for $50. This allowed attendees to get a preview of the course at a controlled speed. The schedule was a little more relaxed in 2015, with the introduction of a "free day" on Friday, where no official events were planned. In addition to releasing the location for NG15, Lori also announced the induction of a brand new member to the official National Gathering committee. The new committee member is the September 2009 3SI Ride of the Month winner: Bridget Dillon (a.k.a. bridge). She is a long-time member of the community that has been a dependable volunteer at previous gatherings. It was announced that Bridget will be in charge of sponsor relations. Registration for the 2015 3S National Gathering officially opened on March 29th, 2015. Early registration, which includes slightly reduced ticket prices, ended on May 31st, 2015. After this date, the price to register increased $20 for normal tickets ($100 to $120), and $10 for guests ($50 to $60). Ticket prices for individual events (Autocross, Road Course, etc) were also expected to increase after early registration. The price per hotel room at the official hotel was $69/night. On June 14th, just weeks prior to the event, Lori announced that the National Gathering needed over an additional $3,000 to upgrade from renting only the west track to renting the full track instead for the scheduled road course. To help achieve this, Lori started a thread and invited members to donate via PayPal in hopes of being able to upgrade before the deadline. Despite 12 members banding together to donate $1,500, it was not enough, and Lori refunded all of the donations. That said, the NG15 had access to the west track only. Attendance was said to be lower than previous years, which cast some doubt as to whether there would be another 3S National Gathering in 2016. Due to the relatively low attendance count compared to earlier years, the NG committee reportedly cut costs where they could, including using basic gray t-shirts, handing out certificates instead of trophies, not renting a video display during the banquet, and opting out of offering refreshments and goodies during registration like they had in the past. Lori also mentioned that the original plan for the NG15 banquet was to include museum admission tickets for those that attended, however the decision was made to not include them in the end. The 2016 3S National Gathering was held in Indianapolis, Indiana. The return to Indianapolis in 2016 marked the 25th year anniversary of when the Dodge Stealth was slated to be the pace car of the Indy 500. The festivities took place at multiple locations around Indianapolis, with the AutoCross happening at Lucas Oil Raceway Park, the Go Karts at Fastimes Indoor Karting, and the Road Course at Putnam Raceway Park. Registration for NG16 officially opened on April 6, 2016 and according to the NG committee, this was the most difficult 3S National Gathering to plan thus far. For the first time in the history of the 3S National Gathering, Lori made the announcement on July 5th, 2015 that the next 3S National Gathering would be held in 1 of 3 potential locations: Indianapolis, Michigan, or Pittsburgh. In order to determine the location, the 3SNG created a voting page where interested parties could pay $25.00 per vote in order to lobby for the location of their choice. Each person could vote as many times as they wanted, and therefore pay $25.00 each time. According to the voting rules, if the location you vote for gets selected, your payment would become non-refundable and the full amount that you paid (plus an additional 10%) would go towards your registration fees for NG16. If your location was not selected, you would have the option of applying your voting payment towards your registration for the new location, or receive a full refund. Indianapolis was the clear winner, making it (and Putnam Park) the official location for the 2016 3000GT/Stealth National Gathering. Notably missing from this year's "official" schedule was the car show and awards banquet. No announcements were made on whether these would take place, however a free day was planned on Friday, 6/24, where no events were scheduled. Very few posts were made about sponsors in 2016. An announcement was eventually made that 3SX Performance had stepped up to fill the Title Sponsor role, and that the event would be renamed to the 3SX National Gathering. Similar to previous years, the NG16 offered a discount for early registrations. The cut-off date was May 28, 2016 to receive this reduced rate, however due to the other 3S-related events and holidays happening that weekend, the early registration cut-off date was extended to June 5, 2016. Compared to the previous year, registration fees had dropped $25 per person due to the partnership on the road course with another group. Just two days after NG16 concluded, Lori announced that long-time National Gathering committee member, Bob Melton, had decided to step down from his position on the committee. His role was to provide on-site assistance on the week of the NG. Additionally, in her announcement, Lori made mention of the low turn-out of NG16 (with 23 registrations as of June 2016) and she offered to take the bulk of the blame. Lori went on to say that she plans to make it up to everyone at NG17. This page was last edited on April 10, 2018, at 22:48.